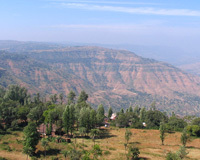 One of the largest hill stations in Maharashtra, spread over 150 sq km, Mahabaleshwar is located on the Western Ghats. It was the summer capital of the Governor of the erstwhile Bombay Presidency during the colonial era. The hill resort is located at a distance of 120 km from Pune and 285 km from Mumbai. With its scenic extravaganza and assuaging climate, Mahabaleshwar is a popular place of recluse for the tourists during the summers. At a height of 1438 m above sea level at its highest lookout point (Sunrise Point), it experiences the footfalls of nature lovers, holidaymakers, adventurous lovers and even filmmakers. The various vantage points and observation towers scattered throughout the place offers some enthralling views of the lush vegetation around and the Koyna and Krishna valleys below. They also offer equally captivating sights of the various waterfalls that constantly meander through its bosom. In fact, the coniferous forest of Mahabaleshwar is one of the few evergreen forests of the world, and imparts a luxuriant feel to the landscape. It stands in stark contrast to the concrete jungles of the cities, and hence heralds a lot of tourists from the urban metropolis throughout the year. Apart from being a popular tourist getaway and a much-favored honeymoon destination, Mahabaleshwar is also an important religious site. The famous Hindu temples of Krishna and Mahabaleshwar are located in the place, and are frequented by local devotees and religious tourists. In fact, the place borrows its name from the famous Hindu deity, 'Mahabali'- the presiding deity of the Mahabaleshwar temple. Moreover, the point of the five rivers- Krishna, Veena, Koyna, Savitri and Gayatri, which flow over the Deccan Plateau, is considered as holy and adds to the mysticism of the place. Mahabaleshwar also offers ample opportunities for the adventurous souls to unleash their exuberant selves. With facilities for boating, fishing, golfing, horse-riding, trekking and the like, one can enjoy a complete fun-filled holiday in the place. Be it sitting under the shade of its undulating trees & reading a book, fishing at the Venna Lake & experiencing the mountain breeze, visiting a temple & merging with Divinity or just gallivanting through its streets, you can easily have the best time of your lives on its lap. So, stop playing the same old tune and get ready for a holiday that is surely going to be etched in your memory forever.